Q: Yesterday morning, Saudi Arabia's King Salman issued a royal decree to appoint the Deputy Crown Prince, Mohammed bin Salman, as Crown Prince and Deputy Prime Minister. What are the comments of the Chinese side? A: The Chinese side has extended its congratulations to the new Crown Prince of Saudi Arabia. We are of the view that the stability and development of Saudi Arabia serves the common interests of the regional countries and international community. China and Saudi Arabia are comprehensive strategic partners. China stands ready to work with Saudi Arabia to implement the important consensuses reached by the two leaders and promote the further development of China-Saudi Arabia relations. Q: Panamanian President Juan Carlos Varela said, when giving an interview in Washington D.C. on June 21 that, he once told Taiwan that Panama would switch its stance once the "diplomatic truce" across the straits ended. Later on when learning about the end of "diplomatic truce", he made the right decision to establish diplomatic relations with China. Varela is the first to clearly state the "diplomatic truce" has ended among the leaders of the countries that "severed diplomatic relations" with Taiwan. Has the "diplomatic truce" across the straits truly come to an end? The one China principle concerns China's core interests and the feelings of the 1.3 billion Chinese people. Staying committed to the one China principle and developing friendly cooperative relations with other countries in the world on the basis of the Five Principles of Peaceful Coexistence is the consistent position of the Chinese government. We will continue to uphold this position in developing friendly cooperative relations with other countries in the world. Q: On the China-US Diplomatic and Security Dialogue, US Secretary of State Rex Tillerson said that China has a diplomatic responsibility to exert much greater economic and diplomatic pressure on the DPRK if China wants to prevent further escalation in the region. What is your response? A: Recently, China has stated its stance on the Korean Peninsula nuclear issue several times. I also answered similar questions yesterday. What I want to point out is that China does not exercise so-called economic and diplomatic pressure in its exchanges with other countries. We stay committed to developing friendly cooperative relations with other countries in the world on the basis of the Five Principles of Peaceful Coexistence. At the same time, we will uphold our own rights and interests and fullfill our international obligations, including implementing the relevant Security Council resolutions. On the Korean nuclear issue, I shall reiterate that China has been making unremitting effort for settling the issue and playing a positive and constructive role. As the tensions rose and the situation escalated, China has actively promoted peace talks. 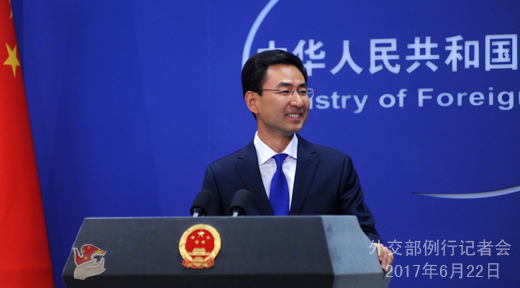 China has put up the dual track approach and the initiative of "suspension for suspension", as well as the proposal to strengthen the effort for both non-proliferation and promoting peace talks. These above-mentioned approach, initiative and proposal have gained understanding and support from an increasing number of countries. Also, we have stressed many times that the crux of the Korean Peninsula nuclear issue does not lie in the Chinese side, neither does China hold the key to solving the problem. We hope relevant parties can play their due role and take their due responsibility and work with the Chinese side to push for the settlement of the Korean nuclear issue. Q: According to media reports, the Japanese government has issued a handbook on the curriculum guidelines to instruct elementary and high schools to teach students in social studies that Diaoyu Dao is Japan's "inherent territory" without territorial disputes. How do you comment on that? A: Diaoyu Dao and its affiliated islands have been China's inherent territory since ancient times. China's resolve and determination to uphold its territorial sovereignty is unwavering. Whatever Japan says or does, the fact that Diaoyu Dao belongs to China cannot be changed. We solemnly urge Japan to face squarely history and reality, stop provocation and educate the young generations with a correct view of history, and avoid creating new obstacles to China-Japan relations. Q: During a congressional hearing, the US lawmakers were informed that the US administration is beginning an inter-agency review towards its relations with Pakistan. The continuation of US aid to Pakistan would be one of the considerations during the review. A US official also told Reuters in New York that the US is now considering expanding drone strikes, withholding financial aid to Pakistan, and downgrading Pakistan status as a major non-NATO ally. Meanwhile, a Pakistani diplomat responded that the US was trying to make Pakistan a scapegoat for the stalemate in Afghanistan. He also mentioned the sacrifices Pakistan has made in the fight against terrorism as well as the effort to improve the situation along Pakistani-Afghan border. What is your comment? A: We have noted relevant reports. Pakistan is an important country in South Asia. Maintaining peace and stability and economic development in Pakistan serves the interests of regional countries and peoples. Pakistan stands at the frontline of international fight against terrorism and has been firmly cracking down on terrorism all along. It has made major sacrifices and contributions to fighting international terrorism and safeguarding regional security and stability. The international community should fully affirm this and support Pakistan's counter-terrorism effort on the basis of respecting its sovereignty and territorial intergrity. Q: There are reports that China cut short a defense meeting with Vietnam because of disputes in the the South China Sea. Can you confirm that? Secondly, can you provide the reasons why a China-Vietnam border meeting between the two militaries has been canceled? A: The Ministry of National Defense has given a response to this question. On your question about the South China Sea, at present, with the concerted efforts of China and regional countries, the situation in the South China Sea has cooled down and de-escalated and taken on a trend of positive development. This hard-won situation is worth cherishing by all parties. Relevant parties should avoid taking any unilateral actions to complicate the situation in disputed waters, work with China for the shared goal and uphold the general picture of bilateral relations and regional peace and stability. Q: Pakistani media said that China has offered to build a dam in the disputed territory between India and Pakistan and to integrate the dam with the China-Pakistan Economic Corridor. What is your comment? A: I have no information at hand about this specific project you mentioned. What I can tell you is that, the China Pakistan Economic Corridor (CPEC) is a cooperation framework built from the perspective of long-term development by China and Pakistan. The CPEC is of important significance not only to the development of the two countries, but also to promoting regional connectivity and the development and prosperity of regional countries. We have stressed several times that the CPEC is an economic cooperation initiative. It is not targeted at any third party, nor does it have anything to do with territorial and sovereign disputes. We hope India and Pakistan can properly resolve the territorial and sovereign disputes between the two sides through negotiation and consultation. Q: To exercise more pressure on the DPRK, will China heighten sanctions or impose unilateral sanctions? A: Our position is very clear-cut. China has always implemented all DPRK-related Security Council resolutions in a comprehensive, accurate, earnest and strict manner. 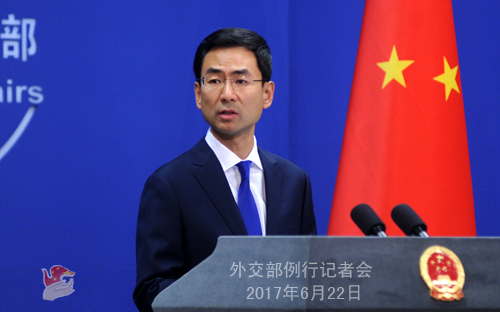 China opposes any so-called unilateral sanctions by other countries in accordance with domestic law. We do not think such deeds will help resolve the issue. Q: The Mongolian presidential election will take place on next Monday. There have been anti-China sentiments expressed by certain candidates. What is your response? A: Regarding the Mongolian general election which you mentioned, I am not aware of that. Mongolia is a close neighbor of China and the two countries enjoy friendly relations. In recent years, bilateral pragmatic cooperation has witnessed quite a few positive outcomes. We hope that the Mongolian general election will be held in a steady and smooth manner. The Chinese side stands ready to continue to work with Mongolia to jointly develop China-Mongolia friendly cooperation. Q: Firstly, reports from Pakistan say that Foreign Minister Wang Yi will visit Pakistan and Afghanistan for mediation between the two countries later this week. Can you give some details and what is his mission about? There are strong differences between the two countries. Secondly, yesterday the Pakistani airforce shot down a drone from Iran, which would raise tensions between the two countries. What is your comment? A: On your second question, I have not seen relevant information. The Chinese side sincerely hopes that relevant regional countries can maintain friendly relations and properly handle relevant issues through dialogue and consultation. On your first question, both Pakistan and Afghanistan are close neighbors of China. 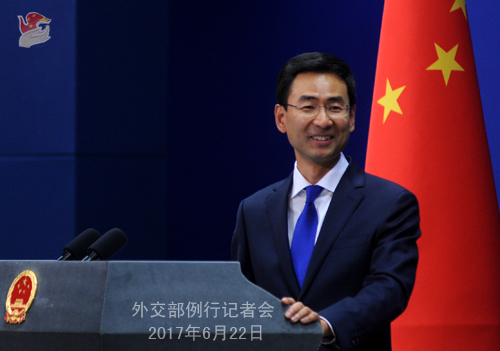 China has maintained friendly relations and frequent exchanges with both countries. If there is any important information about exchange of visits, we will release it in a timely fashion. In addition, the Chinese side sincerely hopes that Pakistan and Afghanistan can strengthen communication, enhance mutual trust, improve relations and jointly uphold the peace, stability and development of the two countries and the region. The Chinese side is willing to play a constructive role in this regard. Q: My question is somewhat long. The Russian border department detained a man who attempted to cross the Russia-China border. He said that he is a US hacker and his name is David Charles. The detainee had no valid documents with him. As he said, he arrived in China with a fake passport of a citizen of Tanzania. He was detained by the Chinese police and officers took his passport to check his identification. But he tried to flee to Russia where he was detained by the Russian border department. According to the Russian border department, his passport information provided by the Chinese side is under the name of a citizen of Tanzania. Can you confirm this? Q: About Foreign Minister Wang Yi's visit to Pakistan and Afghanistan, has the date been announced already or will you announce it later? Because he is supposed to be on this visit from Saturday. A: Like what I have said just now, China maintains close exchanges with Pakistan and Afghanistan. If there is any important information in this regard, we will release it in due course. If the Chinese side knows any information in this respect, we will release it in due course. Q: Yesterday, the Colombian government said that China has released to the Colombian authorities a Colombian inmate jailed in China for drug trafficking. China released him because of humanitarian concerns as he was 68 years old. How many Colombian citizens are jailed in China for drug trafficking? There are allegedly more than 100. Does China have the intention to release all Colombian inmates on humanitarian concerns? A: You may have noted that in recent time, as some foreign citizens in China were engaged in drug trafficking and violated the Criminal Law of the People's Republic of China, some compulsory measures have been taken against them, including the citizens from Columbia. As for the specific case and some specific numbers you mentioned just now, I do not know relevant details. What I can say now is that the Chinese government welcomes foreign citizens to come to China. Meanwhile, we hope that they can observe Chinese laws in good faith and refrain from being engaged in criminal activities. Q: On the disputes in the South China Sea between China and Vietnam, has any new oil rig been moved into the diputed waters? A: Just now I have expounded China's position. I would like to add that Vice Chairman of the Central Military Commission of the People's Liberation Army Fan Changlong paid a visit to Vietnam not long ago. During his visit to Vietnam, Vice Chairman Fan Changlong met with the leaders of the Vietnamese Party and government, including the General Secretary, the President and the Prime Minister of Vietnam. During the meetings, Vice Chairman Fan Changlong reiterated China's position on the South China Sea. He urged the Vietnamese side to abide by the important consensus reached between the leaders of the two Parties and two governments, strengthen strategic communication, properly handle and manage differences and uphold the larger picture of China-Vietnam relations and the peace and stability of the South China Sea. In addition, just now I have said that we hope relevant countries do not take unilateral actions that might complicate the situation in the South China Sea. Q: First, regarding the claim made by the ISIS that it has killed two Chinese nationals, does the Chinese side know the current situation of the two Chinese nationals? Second, the issue of counter-terrorism has been talked about at the China-US Diplomatic and Security Dialogue (D&SD). Before the D&SD, the United States has stated explicitly that it hopes that China can contribute more to the global counter-terrorism efforts, especially in the Iraq's action to fight ISIS. What is China's position on this statement? A: On your first question, we have answered it many times with regard to the two Chinese nationals who have been possibly killed in Pakistan. The Chinese government is highly concerned about the fate of the two Chinese citizens. At present, we are still coordinating with Pakistan to intensify our effort to verify relevant information. On your second question, It is true that China and the United States have exchanged views on the issue of counter-terrorism at the China-US Diplomatic and Security Dialogue. 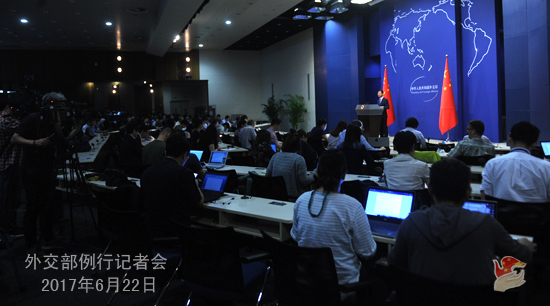 The Chinese side has issued the press release and the United States has held the press briefing. China opposes all forms of terrorism. We hope that China and the United States can step up communication and cooperation in the field of counter-terrorism on the basis of mutual respect, equality and mutual benefit. China has all along made its due efforts to fight terrorism and conduct effective cooperation with relevant countries.